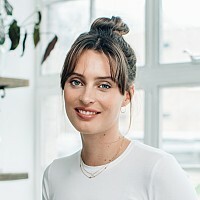 Ella Mills, founder of Deliciously Ella, is an award-winning cookery author and entrepreneur, and a champion of eating well. Ella discovered her passion for plant based recipes after being diagnosed with a rare illness called Postural Tachycardia Syndrome (PoTS). At the age of 20, she couldn’t walk down the street, she slept for 16 hours a day and was in chronic pain most of the time. Conventional medicine failed to help her, so she decided to completely overhaul her diet and overnight the self-confessed ‘sugar monster’ gave up meat, gluten, dairy, sugar and all processed food. The results were incredible! During her illness she started her popular blog, deliciouslyella.com, which has had over 110 million hits in the last three years. Her first book came out in January 2015 and has been the bestselling debut cookbook ever in the UK and a New York Times bestseller. She has since released a further three bestselling books, created a #1 app and, with her husband, opened a deli in London, as well as launching a food product line across the UK. In her latest and most comprehensive cookbook, The Plant-Based Cookbook, Ella shares the most in-demand recipes from her thriving deli, and reflects on her journey from food blogger to bestselling author and entrepreneur.